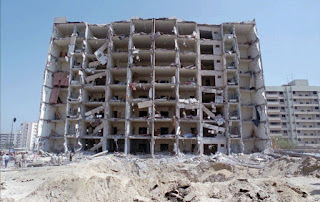 FILE - A June 30, 1996, photo shows a general view of the destroyed Khobar Towers in Dhahran, Saudi Arabia. A man described as the mastermind of the 1996 Khobar Towers bombing that killed 19 American servicemen in Saudi Arabia has been captured, a U.S. and a Saudi official said Wednesday, ending a nearly two-decade manhunt for one of the FBI's most-wanted terrorists. Ahmed al-Mughassil was arrested in Beirut and transferred to Riyadh, the Saudi capital, according to the Saudi newspaper Asharq Alawsat. The Saudi Interior Ministry and Lebanese authorities had no immediate comment on the capture. The 48-year-old suspect was described by the FBI in 2001 as the head of the armed wing of the once-active but shadowy Saudi Hezbollah group. The FBI had offered a $5 million reward for information leading to his arrest. 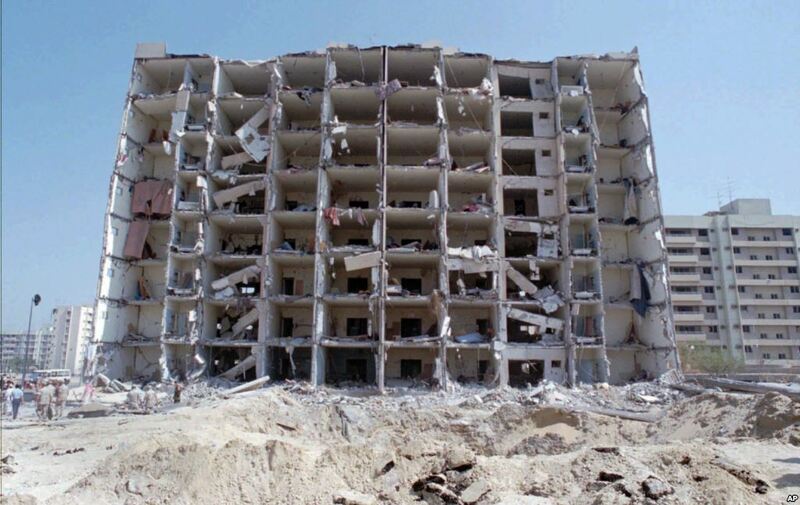 The June 25, 1996, truck bombing at the Khobar Towers, an eight-story dormitory in eastern Saudi Arabia for U.S. Air Force personnel assigned to the Gulf, killed 19 Americans and wounded 372 more. It was the deadliest such attack targeting U.S. forces since the 1983 bombing of the U.S. Marines' barracks in Beirut that killed 241 American servicemen. Al-Mughassil, also known as Abu Omran, is one of 14 people named in a 2001 indictment in Alexandria, Virginia, in connection with the bombing. Charges include murder of federal employees and bombing resulting in death. The U.S. indictment said that elements of the Iranian government inspired, supported and supervised members of the Saudi Hezbollah group in the Khobar Towers attack, but it stopped short of naming any Iranian officials. The Asharq Alawsat newspaper said al-Mughassil was arrested after Saudi authorities identified his whereabouts in Lebanon. A Saudi official told The Associated Press that al-Mughassil was detained two weeks ago after arriving in Beirut from Iran. He allegedly tried to seek cover in a southern Beirut neighborhood that is a stronghold of Lebanon's Hezbollah. The security official said Saudi intelligence believes that four others wanted in the bombing are living in Iran. The Saudi and U.S. officials spoke on condition of anonymity because they were not authorized to publicly discuss the matter. Saudi Arabia has never directly blamed Iran - its regional rival - for the attack, and Iran has repeatedly denied being involved. In 2006, U.S. District Judge Royce C. Lamberth ruled the Iranian government financed the bombing, ordering it to pay $254 million to the attack's victims. The U.S. Justice Department also declined to comment. FBI Director James Comey was the assistant U.S. attorney in Virginia who handled the investigation of the Khobar Towers bombing. In the attack, militants parked a fuel tanker truck just outside the shallow perimeter of the apartment complex, 85 feet from one of the dormitories. The blast tore the face off one side of the building, leaving a massive crater. The U.S. later moved its Air Force contingent to a compound in a remote stretch of desert south of Riyadh before withdrawing its troops from the kingdom in 2003. Details of al-Mughassil's life remain elusive. He was born in Saudi Arabia's eastern city of Qatif, a predominantly underdeveloped Shi’ite region that is home to the kingdom's vast oil reserves. Toby Matthiesen, who has written extensively on Saudi Shi’ites in a book titled “The Other Saudis,” said al-Mughassil was rumored to have gone to Iran after the 1979 revolution and is believed to have fought at some point in Lebanon's 15-year civil war that ended in 1990. The Saudi Hezbollah group, also called Hezbollah al-Hijaz, was established in Saudi Arabia's Eastern Province in 1987 in retaliation to the killing of more than 400 Iranians who died in clashes that same year with Saudi riot police in Mecca during the annual hajj pilgrimage. The kingdom's minority Shi’ites have long complained that Saudi Arabia's Sunni leadership treats their grievances as a security problem rather than an issue to be resolved politically. A handful of prominent Shi’ite activists met with the late King Fahd in 1993 for reconciliation talks after years of violence that included attacks by the Saudi Hezbollah group, which the kingdom has branded a terrorist organization. The meeting - the culmination of many discussions between Saudi officials and Shi’ite activists in exile - resulted in the return of some 350 activists to the kingdom, the release of political prisoners, and a policy that allowed more Shi’ite mosques to be built. After the 1996 Khobar Towers attack, members of the Saudi Hezbollah group were either arrested or fled into exile, Matthiesen said. While the group was largely dismantled after the attack, Shi’ite protesters demanding greater rights are sometimes accused of belonging to the group or supporting it. “The name Hezbollah al-Hijaz has been used to delegitimize any political activity in the Eastern Province,” he said, adding that the group never held mainstream support among Saudi Shi’ites, but had a popular base and a few hundred members at its peak. The group, modeled after the Iranian-backed Hezbollah in Lebanon, assassinated lower-ranking Saudi diplomats abroad and attacked oil installations in the Eastern Province in the late 1980s. The group has claimed responsibility for those attacks, but has consistently denied responsibility for the Khobar bombing, Matthiesen said. Three other Saudis are still on the FBI's most-wanted list for the attack: Ali al-Hoorie, Abdelkarim al-Nasser and Ibrahim al-Yacoub.